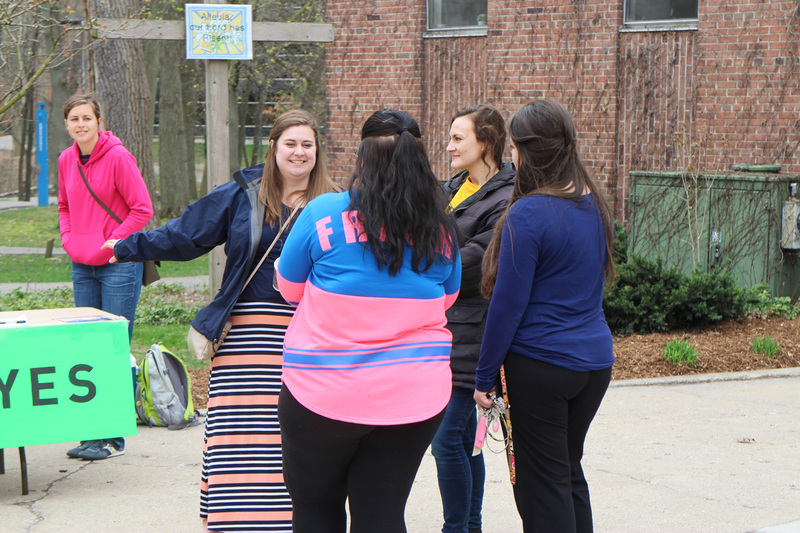 I want to share one more dialogue story from our outreach last month at Aquinas College. 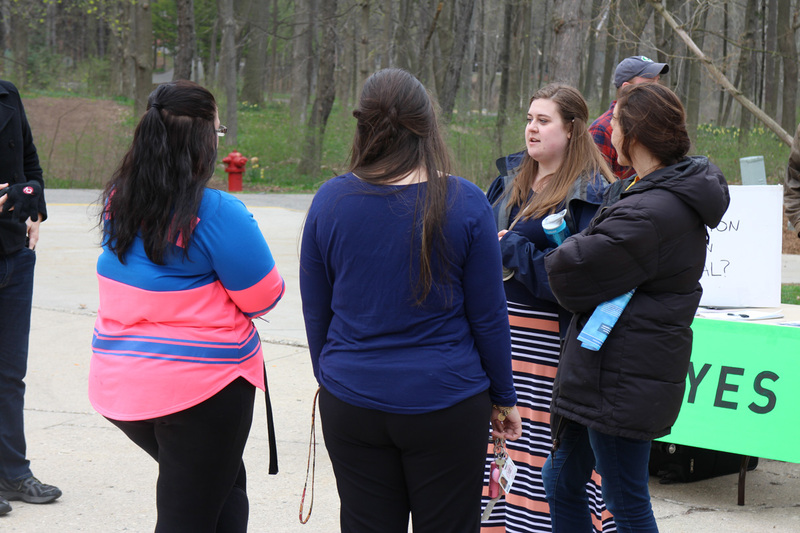 Two fantastic students from the Students for Life club at University of Michigan, Rachel Crawford and Chloe Alberta, spoke to several pro-choice girls. This is what happened. Towards the end of our day of outreach, Rachel and I had a conversation with two girls, who I’ll call Amber and Linda. 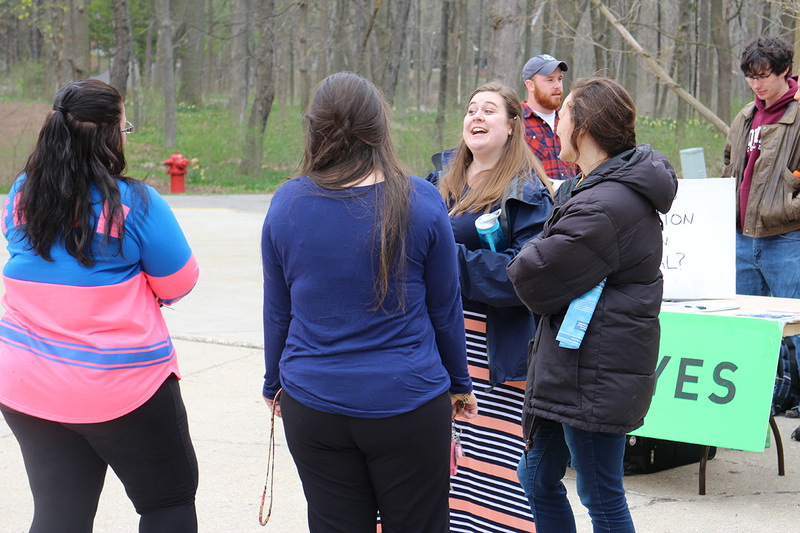 Initially they were very hesitant to participate in the poll, because, as Amber informed us, they didn’t really like to think about the issue of abortion and didn’t really have an opinion on it. Grabbing my handy fetal development chart from the ERI outreach brochure, I asked: “Would you mind if I tell you why it is extremely important to me that people think about abortion?” I showed them the fetal development chart and told them that I believe that human life begins at the moment of fertilization, and that that human life deserves to be protected. I asked them in the name of having ALL the information possible, in order to make the MOST informed decision, would they be willing to look at a picture that shows what an abortion looks like? They declined because, “It’s probably really disturbing.” “You’re right,” I said. “It’s extremely disturbing and I really have trouble looking at them too.” I explained to them that I see that horrible image of the death of an unborn child, and I see one of the biggest human rights violations of our time. And I cannot be silent about that, and I think that is why it is so important to have an opinion about abortion and not let those human lives be looked over. Later, Josh added something that I hadn’t thought of before. He said that if pro-lifers are right, thousands of innocent human lives are being ended, and if we are wrong, we are trying to make a medical procedure that’s morally tantamount to having a mole removed illegal. So either way, you should have an opinion about abortion. At this point there was a lot of nodding and a little giggling because I got really excited when I was explaining my view. Amber and Linda agreed and were laughing a little at my ridiculously peppy tone. I like to tell equal rights arguments to a captivated audience and I find humor to be the quickest route to keeping the attention of the other person or people I am dialoguing with. Amber and Linda seemed like they were thinking a lot about everything I had just said. Taking pro-life philosophy and translating it into applicable terms can be difficult. They didn’t have an immediate response but still wanted to talk. By the end of the conversation I think we gave them a new image of what the pro-life movement is, and I know that they will not feel so indifferent about abortion anymore. We talked about how much love pregnant women deserve, which they do not always receive in this day and age, especially on college campuses. 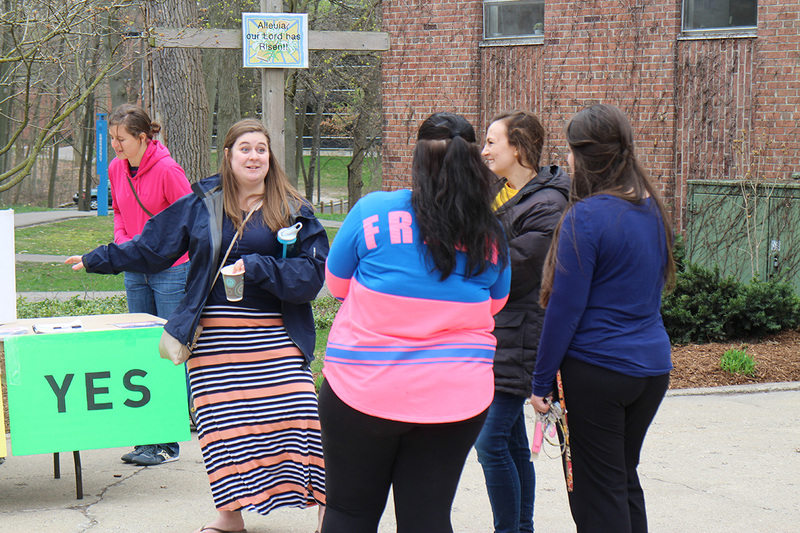 This is where I always get really excited, because pro-choice people never expect to hear that I dedicate a huge amount of my time to the Pregnant on Campus Initiative in the name of helping pregnant students at the University of Michigan. I made sure Linda knew that I truly appreciated how much she cared about women being loved and accepted and achieving their goals. After talking to Linda for quite a while, she shared with us that she had known since she was fifteen that she would be unable to have children. I was incredibly touched that she felt comfortable enough talking to us that she could share such an intimate detail of her life. It was another reminder for me of how important it is to show kindness to every person we talk to about abortion, because even if they walk away more pro-choice than ever, they will know that at least some pro-lifers genuinely care about people – and not just the tiny ones who haven’t yet been born.